Very similar between the two years cycling wise. Felt like I did more cycling in 2015, mainly because of the failed 600k, but I think there were fewer mid distance Audaxes & weekend rides. 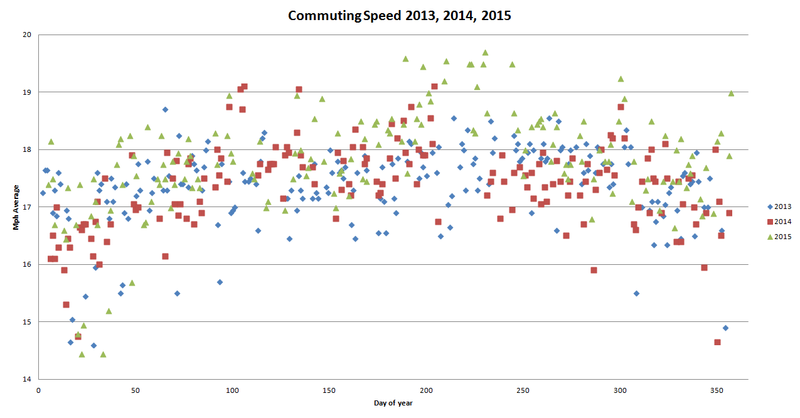 Also average commuting speed (combined moving average of going in and coming home) for all 3 years. Definitely had a good patch through the end of the summer holidays and I think that extra effort (and lack of back pain) lasted through to the end of the year.